So, this is it. It’s time to say goodbye. After spending 7 months in beautiful British Columbia, I am writing my last blog post. With a heavy heart, obviously… And not knowing where to start, because there are way too many great stories to tell. I got a very warm welcome when I entered the world of INTERNeX. Not so warm was the weather in Vancouver at the beginning of my stay though. I remember a lot of snow, more than the city was apparently used to. I also remember hiking through the Lynn Valley during that time with shoes that weren’t winter and especially not water proof. So, guess who had wet and cold feet at the end of that day and a bit of a bad mood? Yep, me. Nevertheless, the longer I stayed in Vancouver, the more I started to love the city, its weather and its surrounding. Looking back at my time there, I cannot imagine anyone who does not love this place. 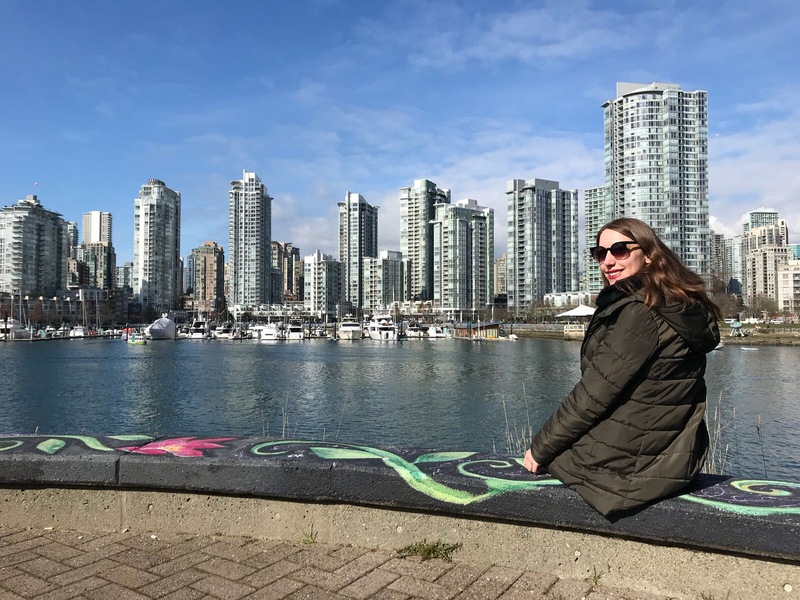 Vancouver is such a multisided city that has everything you need: a busy downtown, beaches, mountains, beautiful nature, a great nightlife and many wonderful people to meet. So many wonderful people, indeed… I am a very lucky person who can say now that I have good friends coming from Sweden, Germany, Brazil, Belgium, Denmark, England, and so many more countries. You made my stay unforgettable and my favourite memories include you guys! To name some of them with their insider jokes: DO YOU WANT CHICKEN WINGS?! – Aiiiiiiiis – whoop whoop! – Vodka quoi? – Kiiiiii!… I know, for most of you readers, this might sound very confusing and weird… But I also know that some of you know EXACTLY what I’m talking about. BUT, those words only won’t be enough to describe the awesome things I did and saw. Thanks to INTERNeX, I could go twice (!) to the Rocky Mountains, for example. Once during winter and once during summer. Both times, I was stunned by the beauty of the country. I was especially mesmerised by the view and the colour of the water Peyto Lake, Lake Louise and Moraine Lake had during summer. 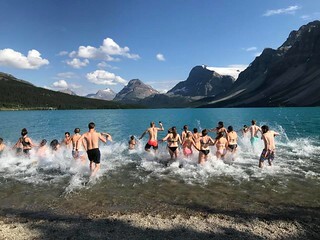 But one of my favourite moments was doing the Polar Bear swim in the 4-degree cold Bow Lake. Brrrrrr, I’m glad that so many of you joined me in this craziness. However, not only did I go on trips with INTERNeX, I also had the chance to organise one on my very own. And so, the PR-team and I decided it’s time to get out of the country. My task became to plan a weekend in Portland, USA! What a challenge, but totally worth doing so. We visited the Chinese Garden, ate Voodoo doughnuts and played mini-golf in black light, to name some of the activities we did. Let me tell you guys: the city itself is simply great! You know what else is great? That every Wednesday, we had our famous PuB NiGHTs! It gave me the chance to chat the nights away and to enjoy the delicious Canadian beer with you. I also loved that sometimes, we could play (music) Bingo during some of these evenings. Play hard – work hard. Or something like that, right? The time I had at the office was just as awesome as my time outside of it. This, on the one hand, thanks to the possibility that we could organise so many weekly events like playing laser tag, a pillow fight or hiking. And on the other hand, because I had the honour of working with a fun and wonderful team! This practicum gave me many opportunities to learn and to grow. Thank you! And now, it’s definitely time to say goodbye. Goodbye INTERNeX, goodbye candidates, goodbye Vancouver, goodbye Canada. Thank you for all the fun times! To quote Doktor Kosmos: ‘Oh, everybody, now. Don’t look at photographs ’cause photographs is not going to change the world. You can’t look back, no no. You must look forward, yes (…)’. I see you all soon again and I cannot wait to create some more exciting memories. Scherbatsky out! Like all good things, my time at INTERNeX has come to an end. What an amazing six months this has been! Although it is time for me to say goodbye now, I would like to tell you about my time here in this beautiful country before I do so. I arrived in Vancouver on the 28th of February. A little bit overwhelmed by all these new impressions, I walked into the office the next day to have a look at the place I was going to be working at the next couple of months. The main topic at the office that day: the trip to Salt Spring Island that was taking place on the weekend. Yes, that’s right. Two days after my arrival, I dove straight into the world of INTERNeX by going on a trip! Staying in a big house in the middle of nowhere, hiking, cider tasting… yeah, not a bad start. Since I only just arrived, I still had to get used to the different time zone, the new surroundings and of course, being in a new country with new people. But you guys made me feel right at home. Because of you, I knew right away that my time in Canada would be an adventure I would never forget. Over the past six months, I have seen many beautiful places, done lots of fun activities and I have met amazing people from all over the world. One trip I really loved was the one to Portland, Oregon. Going to the US has been a dream of mine for years and being able to explore Portland, a city I really wanted to go to, for an entire weekend was definitely a highlight. I also loved our day trip to Seattle, it might have been short, but I enjoyed seeing the first Starbucks, the famous Gum Wall and watching the skyline from the Columbia Center observation deck. Obviously, when talking about my favorite trips, I have to include our trips to the Rockies. How many people, well, non-Canadians, can say they have seen the Rockies during the winter as well as the summer?! From walking on Emerald Lake whilst wearing 10 layers of clothes and slowly sinking into the snow, to canoeing on the lake and being able to see its beautiful, clear blue water. From not seeing any wildlife due to the time of year, to spotting a deer, two elk and a beautiful black bear. Crazy! Seeing a bear was high on my bucket list, so I am glad I could tick it off. Besides our monthly trips, I truly enjoyed getting to know all of you a little better at our weekly PuB NiGHTs. (Music) Bingo, beer pong, karaoke, ‘who am I?’, we did it all. I will definitely miss all of your stories about life in your country, your work, family and your thoughts about Vancouver. Not only did I have lots of fun with you at PuB NiGHTs, I loved experiencing the weekly events we organised for you as well. Hiking in the Lynn Canyon Park, playing laser tag, watching movies at the outdoor cinema, being a Dutchie for a day (even though I am one every day)… I could go on and on. Not to forget, kayaking on Bowen Island with some of you on my birthday and spending Friday nights at the country bar The Yale Saloon to go line-dancing are definitely some of my favorite memories! Not only did I have an amazing time outside of the INTERNeX office, I had a great time at the office itself as well. I was at the office all day five days a week, planning and organising amazing events and trips for you all, and I feel very lucky to have spent these days with such kind-hearted and supportive people. I have learned a lot from my time as a Public Relations coordinator and I wouldn’t have missed it for the world. Before I say my final goodbye, I would like to thank everyone I have met during my stay in Vancouver. It was an adventure of a lifetime! I am grateful for all the friends I’ve made along the way and I cannot wait to reunite with you somewhere else in the world! A new addition to the PR-Team! To those of you wondering who the new girl was on the Salt Spring Island trip, hi! It was me! Some of you already got to know me a little, however, I will introduce myself to those who did not and those who would like to get to know me a little better. My name is Angy. I am 19 years old and from The Netherlands, yes, the flat country known for its tulips and windmills. I do not want to ruin your vision of the country, but I can confirm you do not see those everywhere you go. Truth is, when you visit the Netherlands, you will most likely see rain. And bikes. Lots of bikes (we need something to keep us in shape, right?!). Time to get back on topic. I am a third-year International Leisure Management student at NHTV Breda. The first semester of this school year I went on an exchange to London, so I already experienced what it is like to live abroad. However, I had never been outside of Europe. Going to North America has been a dream of mine since I was little (yes, this tall Dutchie was short too, once upon a time) and when I heard I could do my 6-month practicum in Vancouver, I was more than happy. Living and working here will be a challenge, one that I am excited to take! I cannot wait to discover all that INTERNeX and Vancouver itself have to offer and I hope you want to be part of my journey! I am looking forward to seeing you all tomorrow at PuBNiGHT at the Lamplighter! My name is Björn Jentschke, I’m 21 years old and from southern Germany (close to Munich and Stuttgart). Right now I’m working on my Bachelor of Arts degree in Business Administration specialized on Finance. I have never really thought about going to Canada until I started working with Internex, who offers internships in New Zealand and Canada. So finally I decided to go to Canada and I’ve never regretted that. In my third semester I was constantly thinking about doing an internship abroad as part of my studies, but I didn’t know exactly how to start with that project and wasn’t sure about it at all. Then, I think back in October 2015, I heard about Timothy Wells, the owner of an international exchange agency, would give a little presentation. So I decided to join that and yes, he convinced me to do such an internship abroad. After some weeks I decided to go with Internex, the following decision that I’ve never regretted! 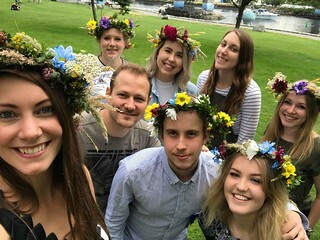 I’ve chosen the international coop because I wanted to gain more experiences in the financial sector besides banks and of course experience how it is to work in another country with a different language and culture. That program was perfect for that. I am placed at a company that is situated in the wealth management sector. So it is all about individual portfolio construction or analysis, a whole financial advice in the matter of tax minimization, pension and also loans. It is a really fast growing company and they just changed their head office to downtown Vancouver, where we have a great lookout over Vancouver. To be successful here you have to show great commitment and being interested in the financial sector. You need to have basic knowledge about financial instruments and Excel. People there are very nice and friendly, so it is an asset if you are also really open. It is not required to do this international placement in my university program, so it is more like an individual gaining of experiences. As a dual student I depended on the permission of my company to do this in my practical time, but luckily that was no problem. Is it useful for my career goals? Yes of course! I just can recommend doing something like this to everyone. Of course it is good for your CV, but I also learned a lot of the investment business from a lot of different people and perspectives now. I also improved my English skills a lot, which is very important and the most important part is that you will really grow as a human; being more confident and experience how other people live. Tim told me in our chat of the beginning of my program just to be confident and trying new things, also in my job here. It is all about that. Here I live in a homestay with three other students and interns. I really enjoyed it. Also the owner of the homestay was fantastic so it was just perfect. The first impression I got from Vancouver is that it looked beautiful between the pacific and the mountains and people were very friendly. Right now I feel very comfortable in this town. The Internex PR-team organises several activities but it’s no duty to attend those, so I wasn’t at every event. But I really think that these events were always very good organized. 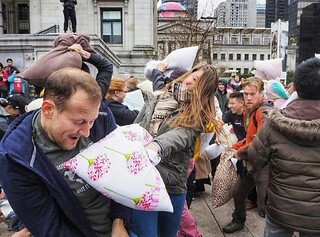 They are a very good opportunity to meet very quickly some new people, especially in the beginning of your stay in Vancouver, and of course to have a lot of fun. On the weekend events you really have the chance to see the environment of Vancouver and a lot of nice places. Also, the PR-team always keeps you updated about changes in the planning or other things. Activities I did and places I visited are: Zip-lining and bungee jumping in Whistler, kayaking in Deep Cove, visiting the VERY BUSY Capilano Suspension Bridge. I went to beautiful Bowen Island, did a weekend trip to Portland and Seattle. I went hiking to Lake Garibaldi and on the Howe Sound Crest Trail. I visited Vancouver Island, went to a country festival in Surrey, walked through Stanley Park and much more! What I like most about Vancouver is of course the location between the mountains in the north and the pacific in the west. Also downtown is a very nice place to be and the environment is beautiful with great nature. In the beginning it was a bit difficult to get used to the language, but after two weeks it wasn’t a problem anymore. With some help I’ve never experienced problems with the public transportation, but you have to be aware of spending every day at least more than one hour just to get from your homestay to work and back. Internex was helpful for me for just organizing everything. From the homestay, to the visa, till the job. Everything worked very well and you can always call them if you have any questions or problems. They always replied within 24 hours and it is very personal and they have the know how. And it is also nice that they are just there if something goes wrong with your job or homestay, cause you will never know. I will definitely recommend Internex.